Our Diagnostic wax up can complete your case treatment planning by allowing you and your patient have a complete visualisation of the final prosthesis. 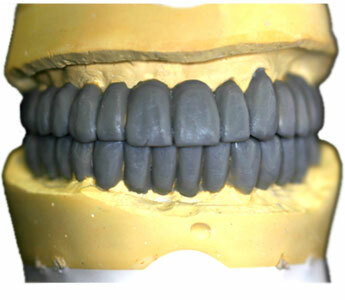 Diagnostic wax up either traditional torch - spatula or CAD/CAM mill system brings more predictable result which can dramatically increase the patient's acceptance of the treatment plan that results a better sales and success for your dental office. With our 3 shape and ZFX scanners we are able to design diagnostic treatment plan images and email it to the office for case consultation after any changes and your approval it can be presented to your patient and milled out of white wax articulated and send it back to the office. All our diagnostic wax up cases includes patients preop and wax up models also a potty matrix a clear suckdown tray for creating provisionals after preparation.